Home / Arduino / Flying Squirrel #2 camps out in the back yard for a battery test. Flying Squirrel #2 camps out in the back yard for a battery test. FS#2 in the Styrofoam flight enclosure. The rubber bands, holding the lid on in the wind, are temporary and will not be part of the flight. The green test lead is used as an antenna for this short range test. The green glow is power of the Arudino board board inside. Our eager squirrel was anxious to try out its new insulated hutch in the back yard and test the battery endurance overnight. Powered by a 3.2V 400 mah LiFePO (Lithium iron phosphate) battery, FS2 remained powered up for just under 16 hours. (15 Hrs 50 mins) This is excellent news because the flight hardware will include a solar cell to charge the battery during the day. 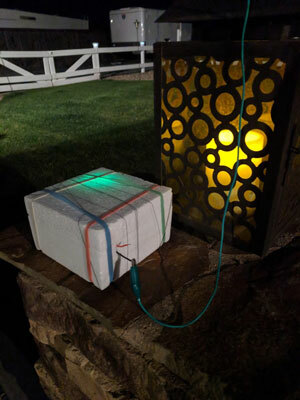 I expect performance of the battery to decline in cooler temps, so with 16 hours warm run time, it is likely to remained charged for most of the 10 hour night. If the battery and hardware do not freeze up overnight, the solar cell will recharge the battery once it is illuminated in the morning.